Romain Avril at Lavelle is a match made in heaven. Come be wrapped in ambiance and fine food. It is no great secret I am a fan of Chef Romain Avril’s cooking. I have been lucky enough to be watching both him and his cuisine grow throughout the years. Chef is now hanging his hat at the fabulous Lavelle, where he is now shouting from the rooftops all that is Canadian when it comes to products and produce while still very much embracing his French roots. There are very few establishments I would venture out to dine at on the snowiest of evenings. I'm so glad my pals Suzie and Ema joined me on this blustery night because we had the most amazing adventure in food. There is great signage out front but that is where it ends. Once we found the place, we had to go down a very ugly corridor and didn’t know what to do next. We found an elevator, went inside and finally found a tiny L. Now you know, so when you go, and you will, you'll know what to look for. We were greeted, upon entering, with friendly faces and perfect service. A glass of Prosecco in hand, we looked outside to some of the most beautiful views Toronto has to offer. Next up was a quick chat with bartender and mixologist, Jonathan Crosson, who knows his way around the bar. He provided us with some really incredible cocktails that were both beautiful and packed a mighty punch. 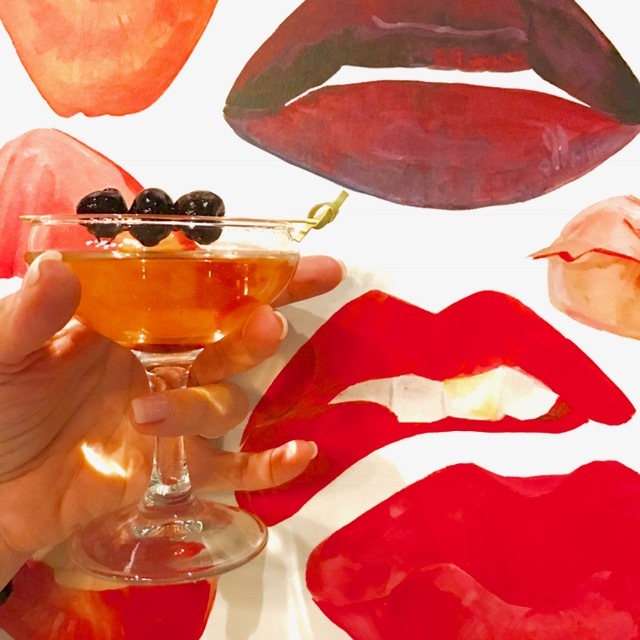 Do try the White Ferrari with Tromba, crème de Cacao and rose petal bitters, or for me, the Make It So was my happy place, as it has Amarena Cherries that have been soaked in booze. We began the feast with one of my favourite foods, a Rabbit and Foie Terrine that was perfectly executed and utilized the entire rabbit. Romain is, like many true chefs, very passionate about nose-to-tail cookery. Chef, like myself, is also a fan of pickled things that give a bright note to a dish like the pickled turnips did here. Served with the most sweetest little baby baguette. All the breads they serve are made with local flours and baked in house. When the Cod Cheek & Leek arrived at the table it was so very pretty with a dusting of leek powder and happy little micro greens. A crispy smelt, one of my favs along with the firmest yet moist piece of sustainable cod. 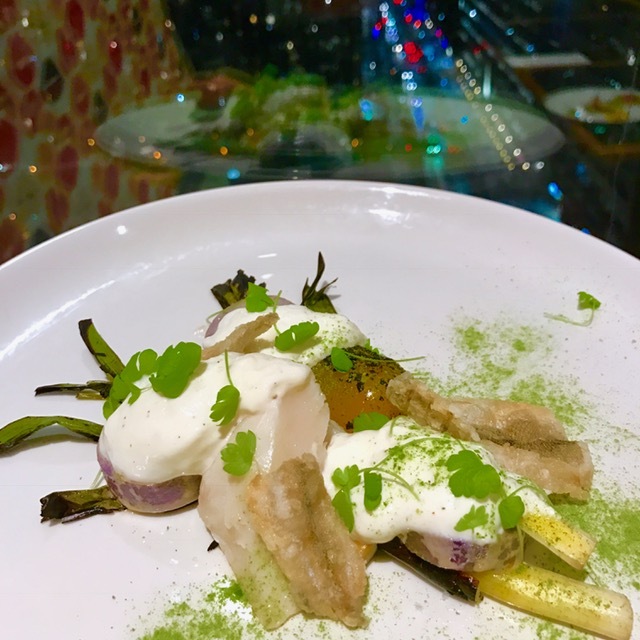 This dish was a nod to Chef’s Mother who made a rustic dish of salt cod, potatoes and leeks dressed with hard-boiled egg yolk vinaigrette. Chef uses perfect sous vide egg yolk to smear like mayo and charred leeks. I haven’t had Coquille St. Jacques in forever and I love it. This rendition strays from the boring to beautiful in that it is presented on a wood board that is topped with beautiful fresh seaweed that lend a slight whiff of the sea. This is then topped with a scallop shell filled to over flow with mussels, clams, prawns, endive, sea asparagus and of course a perfectly seared scallop all enveloped in a divinely decadent Mornay sauce. A dish I highly recommend never goes off the menu, and is also served at lunch in a big big bowl, is the Thai Consommé. Consommé is one of the ways to tell a great chef from a good chef. It must be very rich, highly flavoured, clear as glass and fat free. This was done in spades and then flavoured with all things Thai. Topped with most yet addictive crispy duck and shreds of napa this dish is a winner. Last up was the Tuna Tartare, perfectly executed and a very pretty dish. Fresh cold cubes of tuna tossed with house pickled ginger, a light soy dressing and served with the coolest sesame rice crackers, gluten free heaven. Definitely a crowdpleaser. With all of the appetizers under our belts, and a quick jog around the block, we moved onto mains, of which we shared three. Without a doubt, the all-time winner was the Fogo Island Cod. Romain told us that he receives an entire cod that in turn must age for a week in the fridge to settle down the meat. The cod sitting on a bed of the blackest squid ink barley risotto. Barley was a perfect choice over rice as it isn’t as rich and has a wonderful chew. The dish was then draped in a Champagne Veloute that was so sublime. Just picture the deep black, pale white and the hint of pink with Matane shrimp. We loved the Pan Seared Cornish Hen with chanterelles, incredible carrot puree, black garlic, roasted cipollini and bacon. You certainly cannot go wrong with bacon. The bird is brined and then roasted, virtually guaranteeing a a perfectly cooked bird and truly napped with a classic jus is French perfection. Last up was Heritage Pork Tenderloin Choucroute. There is no more a classic dish than this on French brasserie menus but this ain’t the brasserie version. Utilizing many parts of a heritage pig, which Lavelle buys whole and butchers, it is a lovely dish of meat and sauerkraut. Desserts are the specialty of Cori Murphy over seen by Chef Avril and they are not to be missed. I am a cookie addict and like nothing more than a few of these to nibble on with a creamy milky cocktail. That night we had the canelé, slightly burnt sugar outside and the creamiest vanilla spiked custardy texture inside. You could make yourself sick on these. My other personal favourite was the Chocolate Crème and not because it was chocolate, although that didn’t hurt. I liked the lake of sweetness in this dish with the buckwheat sponge, buttermilk and crème fraiche. A super cool dessert, which was also incredibly stunning, was the Lychee & Hibiscus; hibiscus baba that was like boozy air, intense lychee sorbet, cute little hibiscus meringues and mango gelee. Carrot Textures was very cool and it might not attract you until it is placed in front of you. A rectangle of cake topped with carrot sorbet, a semi circle rope made of yogurt and white chocolate that had us all swooning, cardamom meringue shards, hazelnuts and the local Ontario favoutite to add a hit of tart sea buckthorn. Romain sat down with us to chat food and one of the quotes I loved the best was “ F*** my techniques, it is what is in Canada. Here we have amazing products so just let me do my magic." I do believe we can now call him Canadian. This is also one of my favourite questions to ask chefs - where do you like to eat? Thanks for following my restaurant journey!